Capacity development is a key factor for supporting ownership and action towards resilient coastal and marine ecosystems. The Blue Solutions Initiative developed four modular marine training courses – the Blue Training Courses – focusing on climate change adaptation, ecosystem services, conservation finance and marine spatial planning. Blue Climate Change and Adaptation (CCA, 3-5 training days) introduces the theory and practical starting points of climate change adaptation in coastal and marine areas. This tailor-made training course enhances capacities among development actors and supporting institutions in successfully taking action on blue climate change adaptation. 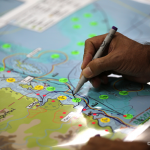 The Blue Planning in Practice (BPiP, 5 training days) course supports the implementation of ecosystem-based marine and coastal planning and management. Watch this video, listen to what participants think about the course and get inspired! The Blue Training Courses have been developed for practitioners, technical staff and decision makers responsible for coastal and marine planning and management and have been conducted successfully in over a dozen countries and world regions in the past four years including a number of countries in Africa, Latin America and South-East Asia. All four courses are based on a case method, which conveys teaching messages mainly through interactive practical exercises. “Since every situation and every country is different, the context of the course is designed in a flexible way in order to be of use in any context.” (Antonio Clemente, Fundación MarViva).